The first Manor of Meliden comprised the former Parish of Meliden, Prestatyn and a small part of Diserth in the county of Denbighshire North Wales. The Manor lies within the ancient cantref (a Hundred can Townships tref) of Tegeingl a name derived from Deceangli a tribe mentioned by the Roman historian Tacitus in the first century. The remains of a Roman Bath House have been discovered and restored on the outskirts of the village. The earliest record of Meliden is to be found in the 1086 Doomsday Book under an ancient name known as RUESTOCK. It has been considered to have some connection with the description of a stockade and certainly fortification existed around those hills during the wars which raged for centuries. Before Henry III built his castle on Graig Back (Castle Quarry) in the thirteenth century as a defence against the Welsh, an earlier building had stood on Graig Fawr, where the struggle between Welsh and Saxon had ravaged the countryside. The parish church is called St. Melyd’s and named after Mellitus, later St. Melyd, an abbot of Rome who was sent with Justus and others to England in 601 to assist St Augustine in his mission. He is cited by most historians to be the first Bishop of London consecrated by St. Augustine of Canterbury in 604 AD. St. Melyd’s day is May 9th. Parts of the church walls date back to the 13th Century and is the only church in Wales to be dedicated to the saint. St. Melyd’s Well may have been a place of early pilgrimage. A mine of historical information – A VILLAGE’s mining heritage has become a gateway landmark. 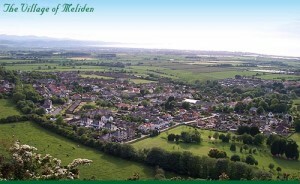 Meliden has a history of lead mining and at one time hundreds of miners worked in the village. The village is also near the last deep mine pit in North Wales at Point of Ayr, and Meliden Residents’ Action Group wanted to do something to acknowledge the importance of these industries. Now a pit wheel and mining carts have been set at the entrance to the village in the first phase of the group’s heritage project for Meliden. 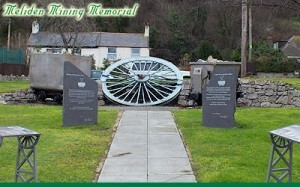 This memorial is dedicated to the mining communities of North Wales, the Lead Mining history of Meliden and its people from Roman times to 1884, when Lead was mined under this site at Talargoch Mine. The Mine Office and the Mining Engineers cottage can still be seen to the right and rear of the memorial. This equipment was used at Point of Ayr Colliery which extracted coal from under the Dee Estuary from 1883 to 1996. Graig Fawr stands guardian above the village and the former mine workings which for nearly a hundred years, throbbed with activity. From the top of the National Trust-owned site, a 10 minute walk from the road behind, you can see Rhyl laid out to the left of the white summit marker. To the right is Prestatyn and Ffrith Beach on the seafront with Meliden below further inland. The surrounding hills are known locally as Prestatyn Hillside, part of the Clwydian Range, and the start of the 177-mile Offa’s Dyke Path between Prestatyn and Chepstow.